Standard Room – Newly Renovated! A wonderful respite for the backpacking traveler looking for a lovely night’s sleep! Our smallest rooms packed with modern day punch. These economical rooms feature a single queen bed, high-definition Samsung 40″ Smart television, and ceiling fan to keep you cool during those warm Hawaii nights. Get refreshed with our on-demand gas heated rain head and handheld shower while lathering with eco-friendly Hawaiian Body Products bath amenities made locally on the Big Island. Room Size: approximately 170 sq. ft.
*First or second floor accommodations. A favorite with long-time guests for its nostalgic appeal! Located in the original 1960’s wing, these original concrete block and faux-wood clad rooms meet the needs of a simple traveler needing a comfortable place to sleep. Comfortable rooms, each with a king bed (Room #12 has 2 twins), a flat screen television and mini-refrigerator. Each room varies in square footage and layout, however, each has its own private bathroom with shower stall. Two of our superior rooms have private lanais. Room Size: approximately 230 sq. ft.
Deluxe Room – Newly Renovated! Perfect for a couple’s weekend getaway! Features a king bed with a 40″ LCD smart television, round dining table with seating for two, single lounge chair for relaxing. Push aside our signature barn door to expose our modern bathroom with ample lighting and counter space. Enjoy the gas heated rain-head and handheld shower with bench while lathering with eco-friendly Hawaiian Body Products bath amenities made locally on the Big Island. Room Size: approximately 280 sq. ft.
Kitchenette Suite – Newly Renovated! The choice among families traveling with small children! Features a king bed with a twin pune’e (daybed), 32″ LCD smart television; fully equipped kitchenette with a mini-refrigerator freezer, over range microwave, 4-burner gas cooktop. Push aside our signature barn door to expose our modern bathroom featuring horseshoe fixtures. Enjoy the gas heated rain-head and handheld shower with bench while lathering with eco-friendly Hawaiian Body Products bath amenities made locally on the Big Island. Room Size: approximately 350 sq. ft. Kitchen Suite – Newly Renovated! A favorite among local work crews and tour groups! Features two twin beds with a full-size pullout sofa sleeper, Samsung 40″ LCD smart television; fully equipped kitchen with a full size refrigerator with automatic ice maker, over range microwave, gas range, round dining table with seating for four. Push aside our signature barn door to expose our modern bathroom featuring horseshoe fixtures. Enjoy the gas heated rain-head and handheld shower with bench while lathering with eco-friendly Hawaiian Body Products bath amenities made locally on the Big Island. Room Size: approximately 390 sq. ft. Temporary combination of original 1960’s Penthouse One and Penthouse Two into “Penthouse Double King Suite”. Prior to next renovation in April 2019, we’ve removed the adjoining door and created one large family suite. Both units have minimal upgrades including a 42″ LCD Television in each bedroom, seating areas to read a book, dining seating for three for sharing a meal together. One king bed in each room, each with it’s own private bathroom. One of the rare units with an outdoor patio. Suite is non-smoking. This suite sleeps 4. NOTE: Careful, each bathroom has varied floor levels due to original plumbing design constraints. Both Penthouse Suites are walk-up only, no elevators available. If you are looking for a spacious and spectacular suite for a multi-night stay, or a large suite for a bridal party to dress in, this is the perfect choice! This large first floor contemporary guest suite has recently been remodeled to include two private bedrooms and two full bathrooms. The Master Suite features a king bed, a spacious seating area with a large sectional chaise. The luxurious Master bathroom has a double vanity which includes its own lighted makeup counter, a rain head walk-in shower with bench, and a deep seat claw foot tub. The second bedroom, enclosed with double barn doors, features two full-size beds, wrapped in spa quality Comphy sheets. The second bathroom is located off the front entry area, allowing guests and their visitors access without disturbing other slumbering guests in the Master Suite or second bedroom. This common area bathroom includes a single vanity with lots of counter space, along with a rain head and hand held walk-in shower with bench. All showers include organic and locally made Hawaiian Body Products in coconut and passion fruit scents. 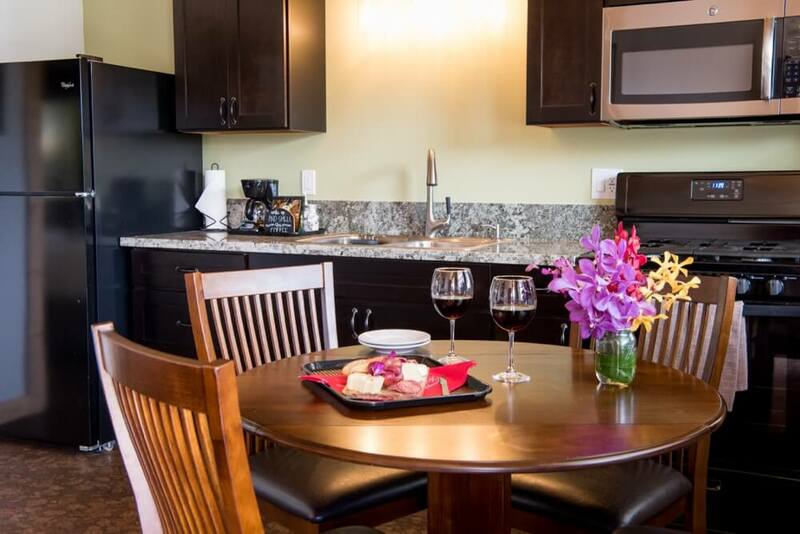 Our fully equipped kitchen provides everything you need for service up to 8 persons, including a full-sized refrigerator with automatic ice maker, gas range with flat top grill and overhead microwave. We’ve also included a 10-cup coffee maker, toaster and rice cooker for your convenience. The large counter top provides seating for 4 for casual dining, or enjoy a meal around the exquisite concrete dining table while watching your favorite movie on our High Definition 55” Samsung Smart television. Suite Size: approximately 1010 sq. ft. Sit back, kick off your boots, and enjoy! A second-floor unit, just under 1000 square feet. This spacious one-bedroom, one bath suite easily accommodates up up to 6 persons comfortably. The barn door enclosed bedroom has a one king bed with a pair of bunk beds located in the open living area. The bunkbeds feature full sized pillow-top mattresses on the bottom and twin memory foam mattresses on top. The living area includes a 48″ Samsung Smart television; full kitchen with a marble bar height counter and 4 barstools; large dining table for six; private bathroom with rain-head shower and double vanity sinks. Engulf your senses with our organic and locally made Hawaiian Body Products in both coconut and passion fruit scents. This suite is perfect for a family with children. Many bridal parties love this suite as a Bachelor Suite because of its rustic paniolo ambiance making it an ideal venue for groomsmen to dress while their counterparts prepare downstairs in Executive Suite One. Discounts available when booking both suites together. Suite Size: approximately 825 sq. ft.  The Kamuela Inn is a non-smoking and pet-free property. Check-in is available from 2:00pm to 9:30pm on the date of your arrival. Check-out is not later than 10:00am on the date of your departure. Late check-outs will incur an additional night’s room charge. Advice of cancellation must be received 48 hours prior to your date of arrival to avoid the one-night’s-stay cancellation fee. A $25 transaction fee will be charged for all cancellations. We accept Visa, MasterCard, Discover Card, American Express, and Company Checks as forms of payment. A one-night’s deposit will be charged at the time of booking to secure your reservation. Cash payments accepted at check-in, please use exact change. Additionally, cash payments for room stay will require a $200 cash security deposit to be returned upon check-out. Current, valid photo identification will be required at check-in (state i.d., driver’s license, passport). Complimentary amenities include continental breakfast daily from 7am to 10am, parking, cable TV, and wi-fi. Irons, ironing boards, hair dryers, and clock radios with alarms are available at no charge on request. Fans, space heaters, extra towels and blankets will incur a nominal utility charge.